When this duck's babies got trapped in a storm drain, a couple of cops helped fish them out and reunite the family. The ducks later released in a pond nearby. 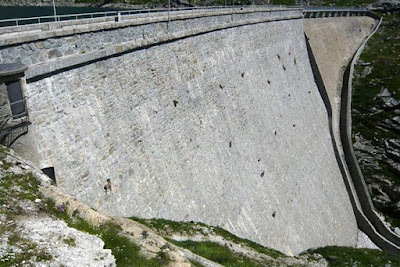 You would not believe what these dots are on the 160ft wall of Cingino Dam in Italy! Those are goats! In the past months, we have featured some goat 'acrobatic spectacle' here in our website; we have tree climbing goats in Morocco and mountain goats making cliffs as their playground. Now, we came across with this new display, specifically the Alpine Ibex, climbing the nearly vertical wall of Cingino Dam in Italy. 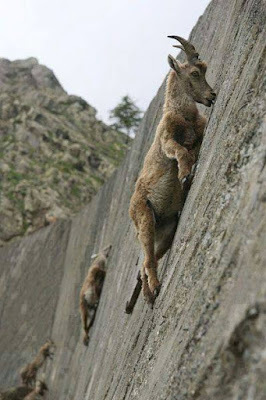 Why these goats climb the wall? They are licking the salt deposits in the rocks because their veggie diets don't provide them with enough sodium. See the series of mind-blowing photos below to get a closer look plus the video!